In autumn of 2007, after a trip to the Baron von Steuben Memorial Site in Remsen, we took a late-afternoon drive through the Adirondacks. I scooted up Route 28 to White Lake. It is absolutely beautiful here. We couldn’t get very close to the lake. “Private Property” signs screamed at us from all directions. Aw! Well, I am not one to rip private property rights, but I’ll say it was sure hard to refrain from trespassing! What beautiful lakefront properties! And since this is Oneida County, these properties must cost a very pretty penny to own. We meandered back down Route 28 for a while. 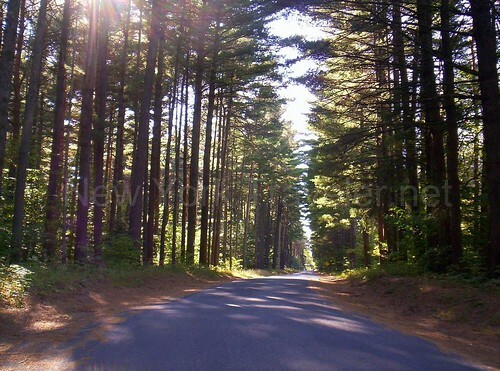 I wanted to get off the “main drag.” Even though I begrudgingly maintained a speed of 55 miles per hour through this wooded wonderland, huge SUVs and monster pick-up trucks breathed down my tailpipe, pushing me to go faster. Hey, this is the Adirondacks, buster; how can you roar right through them without even a glance and a sigh? I don’t know what it is about SUV drivers, either. I mean, I drive a minivan– no tiny tin can– and still these SUV tanks bully me and budge me to the side. Yow. Driving is, unfortunately, not very pleasant any more. So I looked for a “country” road to explore. We checked our map and I turned onto Round Lake Road. I am still not sure if this road is private property, or even if it is Round Lake Rd, for that matter. Street signs were glaringly absent, so I was at the mercy of my van’s dashboard compass and our interpretation of our map! Oh, but the drive did not disappoint. It was lovely. At one place, we stopped the van to explore the area. Folks, this is Upstate New York. Quintessential. Exquisite. The kids were quiet (as I told them to be). We looked for animal tracks and inspected the beautiful lush ferns growing by the side of the road. 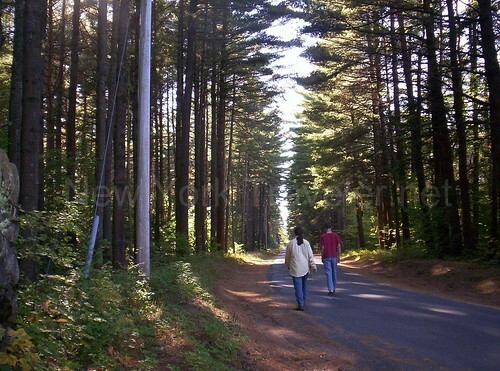 We were awed and dwarfed by such massively tall pines. However, I was a little self-conscious. I wasn’t sure if our pit stop was permitted. 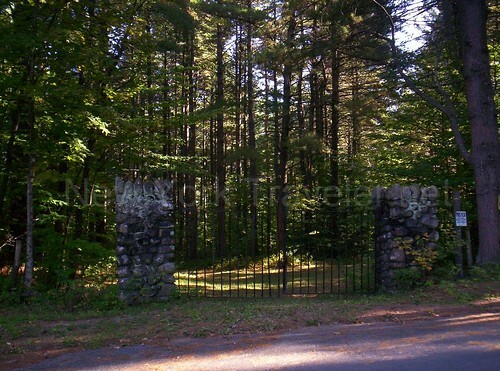 We’d parked near a lovely stone and iron gate that led to, according to signs, Masonic Home Camp trails. There were a lot of “private property” signs. I was on the alert for other travelers. At one point, I thought I heard a car coming. Have you ever heard that sound? It sounds like a faint whooshing sound that grows louder– it is actually the car tires on the asphalt pavement making that sound. I listened and listened as the whooshing got a little louder, but no car ever came. Then it dawned on me! It was the sound of the wind blowing high over the pine trees. We heard the sound long before we saw the trees finally bristle with the wind. The afternoon heat of the sun was beginning to wane, so the wind had gathered up and was running its chilly fingers through the bough branches, in preparation for the cool evening. The delicious scent of pine drizzled down to us at the forest floor. It was glorious. The picture of the lake is stunning! And the roads are calling me to walk along them. beautiful. Hello, A! 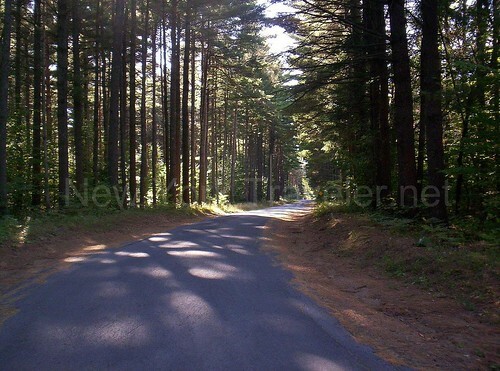 Yes, the roads are soooo beautiful… in the summer! Right now it’s ice up there. 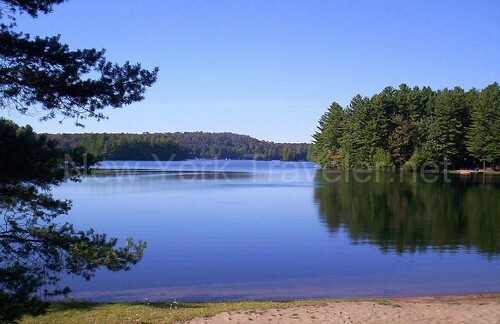 We hope to go camping in the Adirondacks sometime this year. Stay tuned! Are there fish in white lake? Rock Bass, Rainbow & Lake Trout, small mouth. Its a hard lake to catch fish but they’re in there.